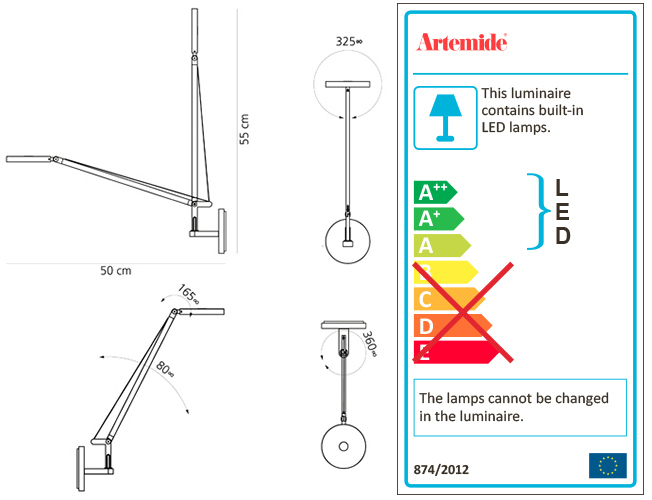 ARTEMIDE DEMETRA MICRO WALL is a wall lamp. Demetra micro offers the same freedom of the traditional version, i.e. utmost flexibility in directing light across space. While its power and flow are just slightly reduced compared to the classical version, it has all the same pluses in terms of operation and lighting performance. warm light tone very high Cri 90 light quality maximum performance Dimmable with microswitch located on the appliance’s head, it emits warm light with a very high colour yield (Cri 90) Its dimension is therefore minimized to fit into the smallest spaces and to expand the range of potential applications of the entire Demetra family, ideal for work and hospitality locations, as well as for home use. Integrated LED not replaceable, 2700K, 6W, 241lm, CRI=90. Dimmer.